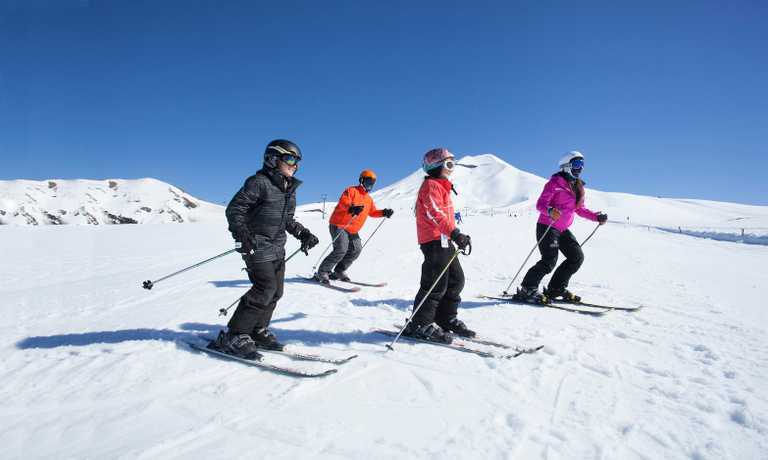 Ski four of Chile's iconic volcanos, staying in beautiful lodges along the way. Ski amongst Araucaria forest during the day and unwind in the thermal hot springs in the evening. A classic Chilean ski experience. Pick up at Temuco airport or Bus Station. Drive to Malalcahuello. Total altitude gain from ski area 1.200m. Short drive to Corralco ski area. 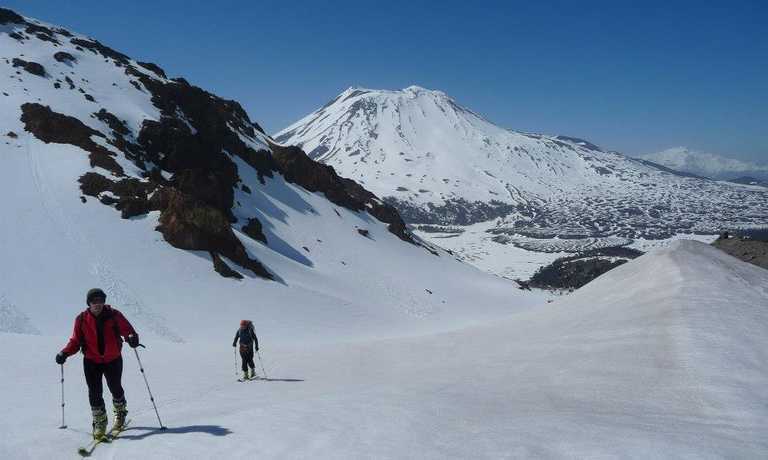 Ski up Lonquimay volcano, contemplate our first great panoramic view of the Araucania area, Tolhuaca volcano, Copahue, Callaqui, Llaima and more. Amazing downhill in a wide area of this volcano. Back to our mountain refuge. Visit spa Malalcahuello hot spring to enjoy the relaxing hot thermal water. Drive to Arenales ski area located 30 minutes from our Lodge. Ski up, altitude gain 500m. Back to our mountain lodge. Drive to Conguillio National park. Start our trip from Lake Captren towards the summit. 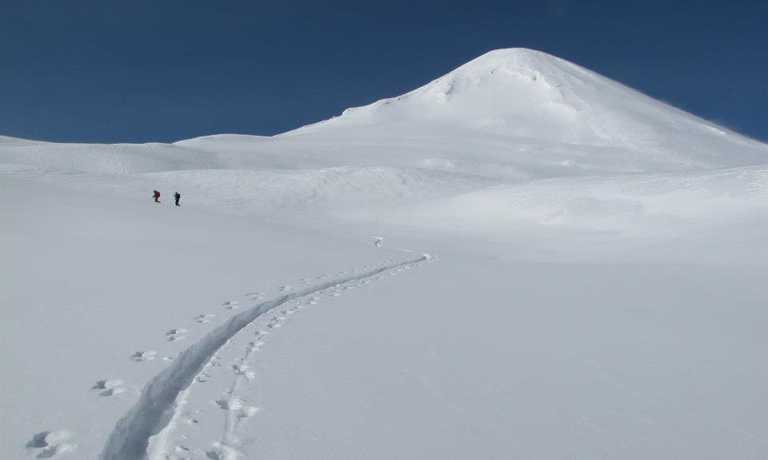 It is a long traverse but even if you do not have enough time to reach the summit, Llaima offers you a great ski. Downhill through west side of the volcano towards Araucarias Ski area. Transfer to Sollipulli. Day 5: Ski Sollipuli Volcano. Start from Araucaria forest. Altitude gain 600m. From the top, we go into the crater, ski down until base of the crater. This impressive crater is covered by a glacier 5km wide, giving us an alternative ski slope. Back to our Lodge. Day 6: Drive to Pucon. 3 hour drive to Pucon, a touristic village located besides Villarrica Vocano. Dinner not included. Here there are a wide range of restaurants to choose from. Total ascent gain from ski area 1.600m. Ascent by north side. Arrival at ski area of this volcano with a great view of Villarrica lake. 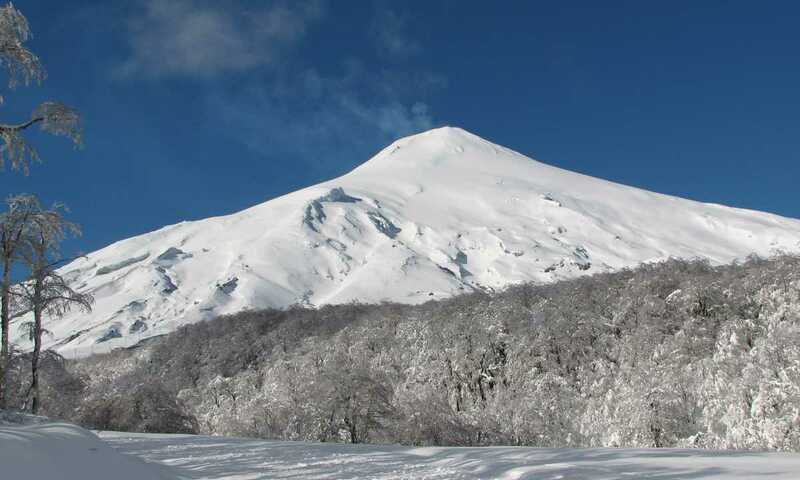 We will go up hill in our skis until the crater of this active volcano at 2,840m. From here is possible to see lava flows into the crater. After that, a perfect ski down the same side to Pucon. Drive to cabin. Dinner not included. Day 8: Drive back to Temuco. The price for a group of 4 people is $2,150 USD per person, for 3 people is $2,200 USD per person and for a group of 2 people the price is $2500 USD. Departures can be set up on a date of your choice and we will help to form groups of likeminded travellers. Backcountry safety gear, transceiver, shovel, prove.